Experience your own spacious 4 bedroom cabin in beautiful Pigeon Forge or Gatlinburg! With excellent amenities like jacuzzis, hot tubs, game rooms, and more, these cabin rentals in the Smoky Mountains are the perfect place to gather with your family or group. Looking for ideal family cabins for rent in Pigeon Forge for your summer vacation or small group gathering? Cabins USA is ready to serve your cabin rental needs with our choice 4 bedroom Pigeon Forge cabin rentals. With convenient locations and comfortable amenities, a cabin stay is the perfect way to enjoy the Smoky Mountains with your family. 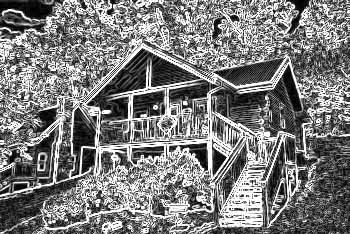 Our 4 bedroom Smoky Mountain cabins place you in the heart of all the action of the Smokies. Enjoy mini-golf, family fun parks, and outlet shopping on the Parkway. Go to the top of the Gatlinburg Space Needle and browse the shops of downtown Gatlinburg. See the natural splendor of the Great Smoky Mountains National Park. Our Sevierville and Wears Valley rental cabins appeal to guest seeking vacation accommodations higher in the mountains or in a slightly slower paced setting. There's so much to do in the Smokies that your family will enjoy non-stop fun the entire vacation. There's plenty of fun to be had back at the cabin as well. With game rooms stocked with everything from air hockey tables to arcade games, the kids will have hours of fun. Features like hot tubs and jacuzzis help mom and dad relax, while more practical features such as spacious kitchens allow the family to enjoy quality time together enjoy cost-saving meals made in your cabin. Need even more space for your larger family or group? Cabins USA provides guests with even more space to relax and have on their Smoky Mountain family vacation with their 5 bedroom cabins. These cabins allow the entire family to sit back and relax in the comfort of their own spacious bedroom. Begin planning your Smoky Mountains family vacation today when you book one of 4 bedroom cabins online and save 15% immediately on your reservation!